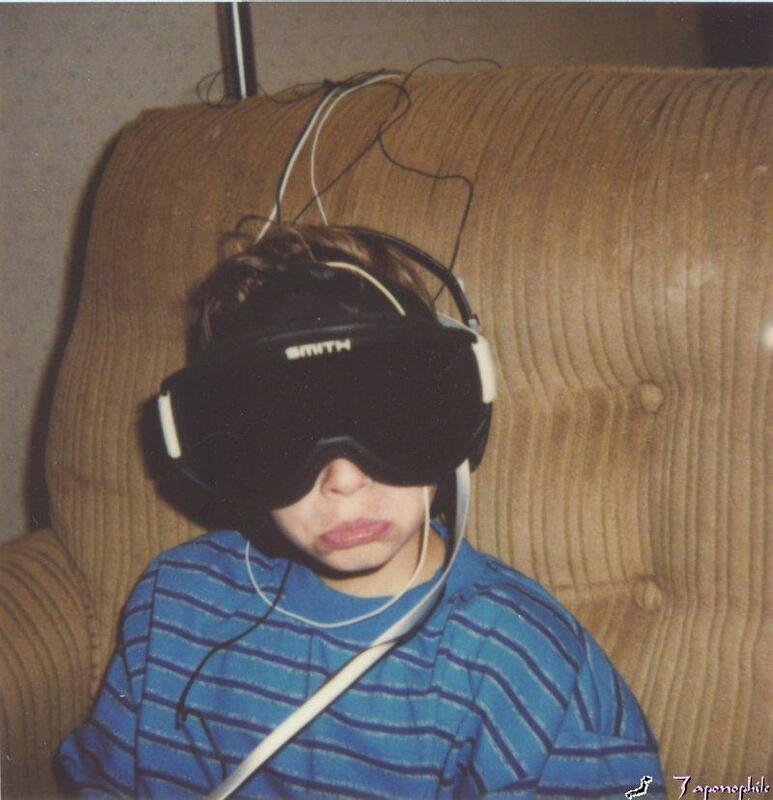 Developed in the early 1990s by Dr. Len Ochs of California, the LENS stands for Low Energy Neurofeedback System. (The story is told in far more detail in The Healing Power of Neurofeedback: The Revolutionary LENS Technique for Restoring Optimal Brain Function, by Dr. Stephen Larsen, 2006) See also ochslabs.com.The LENS technique seems to help so many problems because its action is not to attack any symptom or illness, but to help the nervous system balance itself. While its mechanism is not fully understood, what is certain is that it is a passive process. The client is not required to do anything. It happens by itself; using doses of electrical energy (or radio waves) far too small to do any harm. 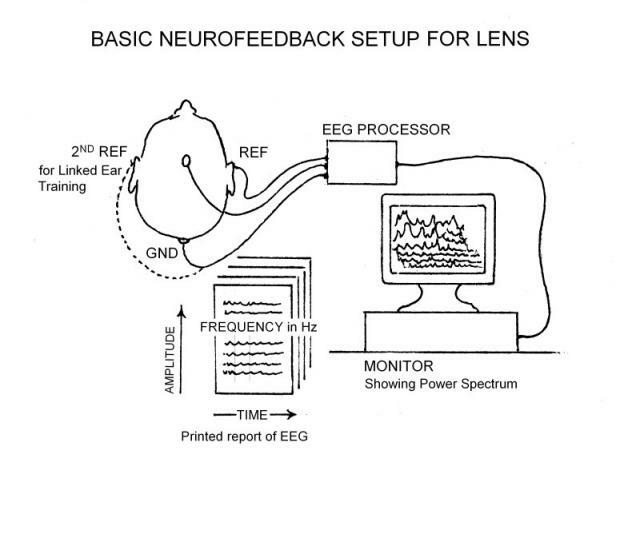 Where traditional neurofeedback selects from among the possible frequency signatures of the brain, and tries to get the brain to change its activity in a certain area, for example speeding up if it is too slow or slowing down if it is too fast, the LENS allows the brain to pick its own self-corrective adjustments. 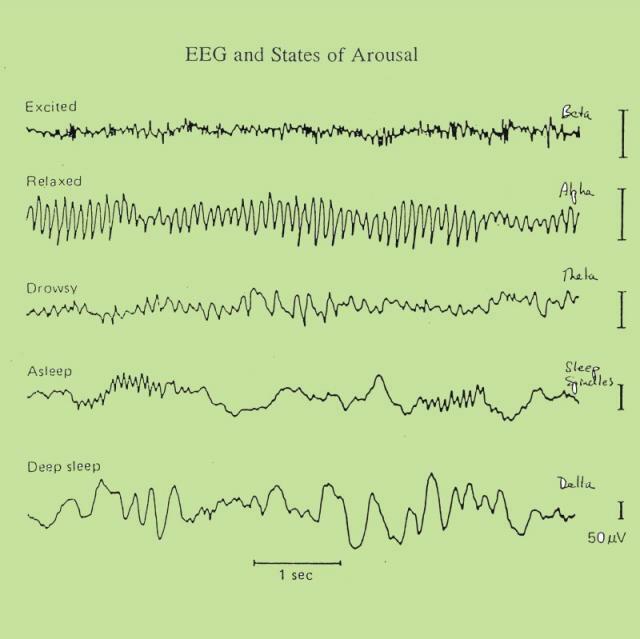 Whereas traditional neurofeedback works with the named and measured EEG ranges (Alpha, Beta, Delta, Theta, Gamma), the LENS bases its feedback on the dominant frequency or the one which is highest in amplitude. By giving the feedback directly to the brain, all operant conditioning dimensions of the process–that is, “trying to do something”–are avoided, and the patient just sits quietly with closed eyes and does nothing. Clinicians suspect that the reason the effects are often so immediate is that they bypass all conscious conditioning, and operate directly on the unconscious processes that undergird most of our functioning–including what mood you are in, how quick you are on the “uptake” and how easily you fall asleep and wake up again. The story is told in more detail of how at first, lights from LED’s in glasses seemed to be producing the effect. Then highly sensitive patients required attenuating the light more and more (even covering it with opaque materials). A Clearly Pleased Early Client with the “glasses. 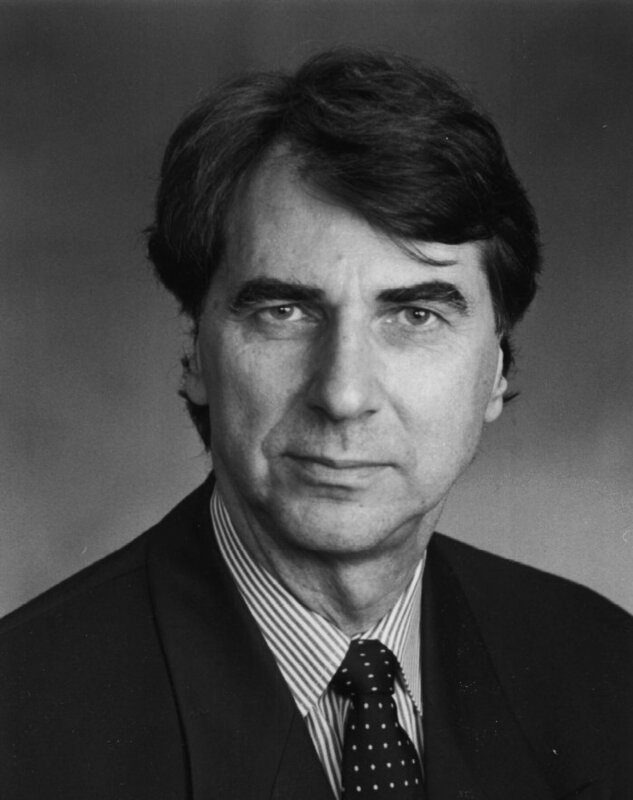 A paper presented by practioner Evelyn Soehner at the 2002 AAPB conference cites the presence in the brain of a ferro-magnetic material called magnetite. (This would explain the brain’s ability to respond to electromagnetic energy of any sort. 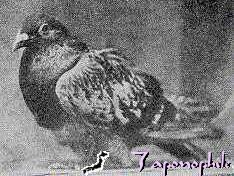 Magnetite seems to be a vestigial remnant of prior evolutionary forms that used it for navigation (as did carrier pigeons such as the famous WWI war hero Cher Ami. Other creatures which use navigational systems based on the Earth’s magnetic field such as the loggerhead turtle.) Magnetite is found in high concentration in the pineal gland and also in the Hippocampus, which is used for storage of emotionally meaningful memories. Modern treatments such as rTCMR (repetitive Transcranial Magnetic Stimulation also count on the brain’s receptivity to electromagnetic current. 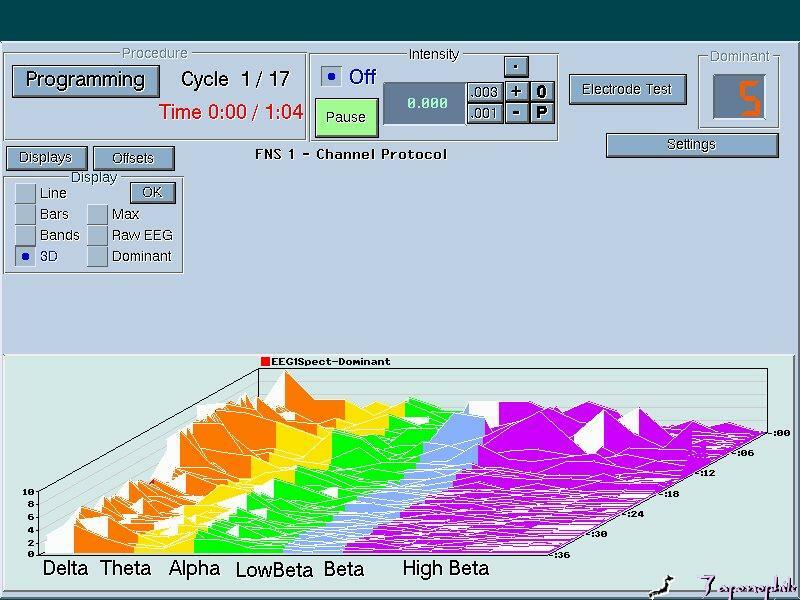 Raw EEG is at the top of the graph, while below is the “bandpass analysis” based on FFT’s or Fast Fourier Transforms of the raw EEG. In this analysis we see an activation in both low frequency and very high frequency bandwidths, implying a very unstable or perhaps “bipolar” configuration. The “power spectrum” to the left is a comparable analysis of the same chart, showing elevations of the spectrum in Delta and Hi Beta frequency ranges. 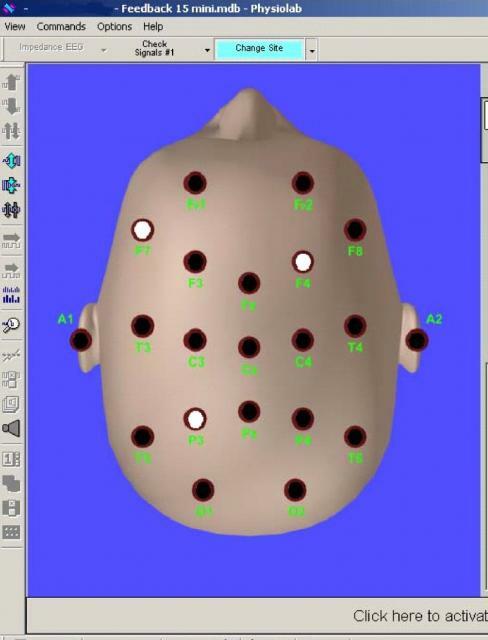 The LENS usually uses (after an Intake Interview) a 19 or 21 site topographic brain map. Other procedures such as an Offset where appropriate, and a variety of intensities and durations of treatments depending upon the person’s sensitivity or hardiness (See CNS Questionnaire and Sensitivity Reactivity Questionnaire on Ochslabs website). Below is the trajectory of Improvement in a 22 year old with severe agoraphobia (and sudden onset). at the end of twenty treatments, all targeted areas of Anxiety, Depression, Disorganization, Insomnia, Fatigue, Sleep Disturbance, Restless Leg are diminished almost to baseline. 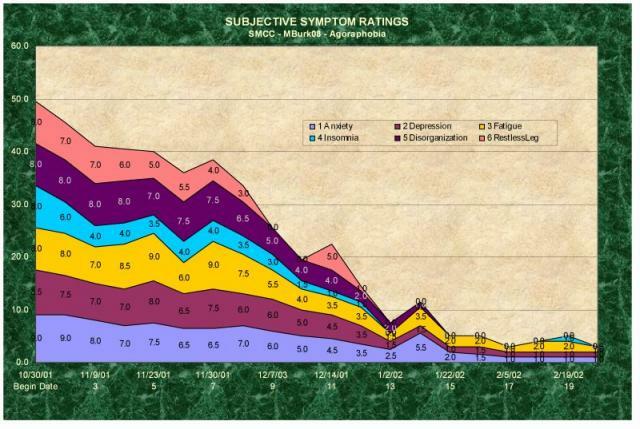 Improvement shows little ups and downs, but this Excel graph (created by Robin Larsen, Ph.D) shows areas of discomfort, with most of the above areas dimininished from 8-10, to around 1 or less after 20 sessions.